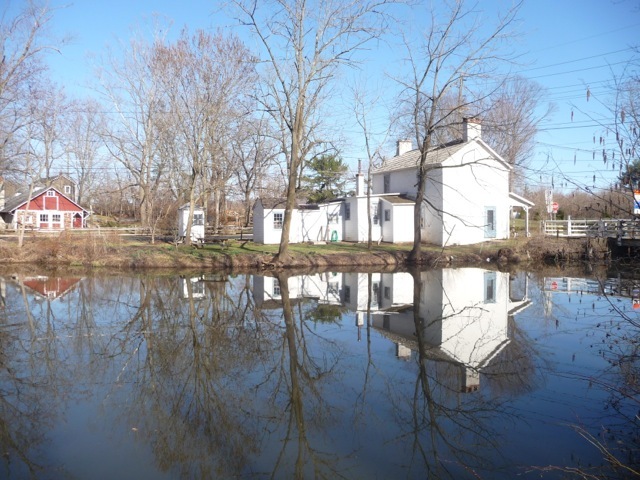 I expected noise; I expected traffic; I expected cityscapes, but instead our group found secluded trails, green belted waterways and historic buildings during our walk through New Jersey largely parallel to route 29. Being unaware of the historic water transportation system that linked the Pennsylvania coal fields to industrial centers of the next two states, I was surprised and delighted to find paths and cannels had been turned into a wonderful foot trail. This was the Delaware and Raritan Canal, the path of mules and tugs that moved barges of raw materials over 50 miles of waterways. The D&R was built across central New Jersey to provide an easy route for freight from Philadelphia to New York. Early boats could navigate the Delaware River to Bordertown and the Raritan River to New Brunswick. These cities were selected as the start and end points and in 1830 a cannel was dug between the two cities by the hands of Irish immigrants. It was finished in 1834 with a complete system of water feeder cannels and locks to control water levels. For 100 years, the D&R was one of America’s busiest commercial avenues but by the end of the 19th century, the cannel had lost business to the railroad and finished operation in 1932. The State of New Jersey took over the cannel and changed it into a water supply system replacing locks with dams and filling sections. In l974, over 60 miles of the canal and a narrow strip of land on both banks were make into a state park which was designated a National Recreation Trail in 1992. This was the historic path that we enjoyed for two days of our long walk. We first encountered the beauty of the cannel at the 6 Mile Run Reservoir located at Somerset, New Jersey. The area is filled with 18th century Dutch farmhouses, agricultural land, open space, forests, small towns and many things bucolic. On day one we hiked about 12 miles on the old towpath constructed for barge pulling mules and we appreciated this soft footing after our days on concrete. We ended our first day of walking along water at Blackwells Mills Cannel House, the site of a bridge tenders house and a picturesque wooden bridge which allowed use to cross the cannel. We returned to Blackwells Mill for our second day of walking moving toward locks #8 and Carnegie Lake, the wide water enjoyed by the Princeton rowing teams. We covered about 14 miles ending our day in the city of Princeton. This part of the long walk was a pleasure to the eyes, ears, and feet and was a welcome surprise to someone expecting mainly urban experiences.